I was following and commenting on a post on Twenty Sided (a blog by the guy who brought us DM of the Rings, one of the greatest web comics ever) about the Pandora music service. For those who don’t know, Pandora is a high-minded internet radio service that attempts to define the traits, or genomes, of all songs, and then learn what exactly you like in music. Theoretically, this will result in radio stations that play exactly the kind of songs you’ll like. I mentioned how I hadn’t had much success so far with the service, but honestly it was mostly because of underuse. The only problem is that I’m already dedicated to another service that tracks my iTunes usage, Last.FM. 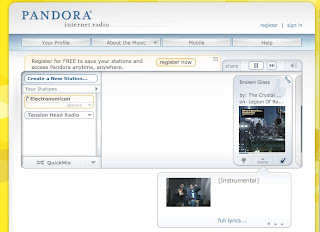 However, Pandora is more sophisticated at the base level, and allows you to see what it is you like in music. As someone who once had delusions of being a music writer, I find it’s my duty to discover exactly what I like in music. Of course, this does mean some sacrifice. I won’t be playing Mighty Boosh episodes in the background while I work for one. Also, I may be subjected to Nickelback even more than I already have it invade my consciousness. However, I will face these travails to bring the most honest report I can muster. Now, some starting explanation. The way you start a radio station on Pandora is by “seeding” it with one or more songs, artists, or genres you enjoy. I’m not sure what the limit is per station, but I’ve used my iTunes 25 most played songs list, along with just general preferences since this is my computer with the least listening data, to generate 5 songs that give somewhat of a variety without being too disparate. Unfortunately, I will never get to hear those songs due to Pandora’s agreements with their music suppliers (they can’t play any songs you specifically request). I’ll also probably get many rubbish recommendations at first, since the system will be trying to find middle-ground between some very different tracks, especially with the rap song thrown into the mix. However, I’m truly curious to see what the results are after a week of listening.